Downtown Portland, Oregon extends west from the Willamette River to Interstate 405, and south from the Union Station train depot to just south of the Portland State University campus. 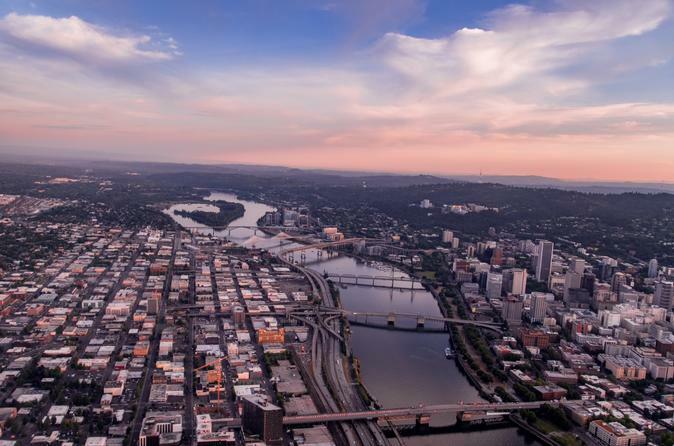 High-density business and residential towers rise into the skies of Oregon's largest city and metropolitan area where bustling highways and roadways converge to maintain the demands of commerce and tourism. With a network of public transport light-rail train stations, trams, streetcars, and pedi-cabs, the city is vibrant, unique, and awesome in a way only Portland can be. Sorrounded by hills to the west, a river populated by numerous bridges, and a breathtaking view of Mt. Hood to the east, Portland is one of America's favorite cities. All flights begin and end at the Portland-Troutdale Airport at the mouth of the beautiful Columbia River Gorge. You will be flying in a small, light airplane that seats three plus a pilot. Your adventures will fly you low across the landscape that the beautiful Pacific Northwest has to offer or above the industrial landscape of Portland, Oregon. It's breathtaking, unforgettable, exciting, all rolled together. Notice: All prices are per flight, not per person! Select 1 traveler at checkout for your group of 1-3 passengers. If you have more than one traveler, please note additional traveler weights in the 'special requirements' box at checkout.